I frequently comment on major elections, but here we are with voting for UK prime minister now in progress, and I have not chimed in yet. Unlike in Greece where I was confident Syriza would poll better than expected (and it did), I have no particular feeling of confidence on what is likely to be a a very important election. Voting Booths are just now open as of 1:00AM US central where I reside. 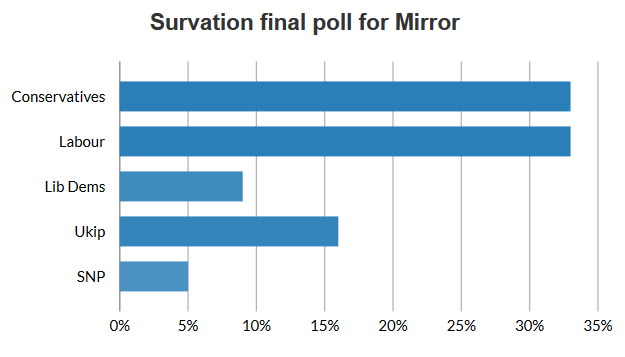 Here are the Final Polls. Note that UKIP is in third place. How do you think that will translate into parliamentary representation? 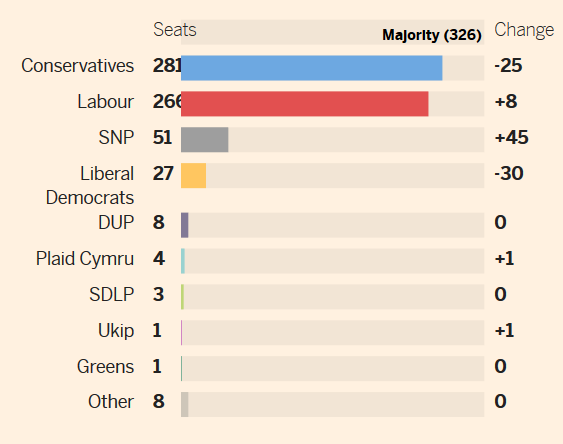 Here is a Final Projection from the Financial Times. Note the apparent silliness of it all. What matters is how concentrated the votes are, not how many you get. 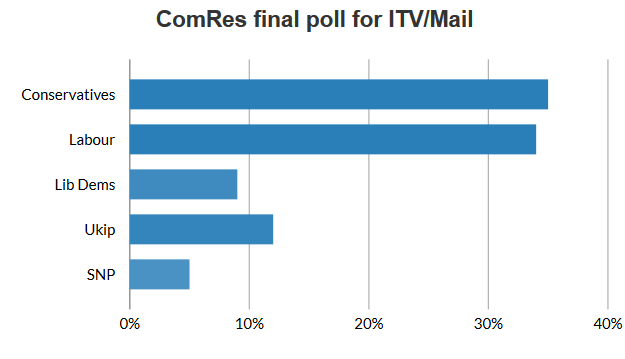 On a guess the revolt vote is underestimated, I am going to go out on a limb and suggest UKIP will win 7-10 seats. The most likely outcome is there will not be a winner. The Guardian reports General election 2015: Britain heading for hung parliament. If this sounds confusing, it is because it is confusing. Bloomberg highlights the issues in U.K. Votes in Unprecedented Election With Outcome Elusive. Polls suggest that neither Conservative Prime Minister David Cameron nor his Labour opponent Ed Miliband will come close to getting enough seats in Parliament to govern alone. Instead, they face days or even weeks of talks to try to win over enough smaller parties to command a majority. The uncertainty attached to the electoral outcome in a Group of Seven nation is beginning to play out in markets, with volatility buffeting the pound and gilts. One reason is the political risks even once a government is formed: If Cameron manages to stay in office, he’ll hold a referendum on leaving the European Union. If Miliband gets in, it will be with the support of the Scottish National Party, which will be looking for opportunities to further the cause of independence. While the Labour and Tory campaigns have failed to inspire the electorate -- the polls have stubbornly refused to budge since the beginning of the year -- other parties have engaged voters who have been sidelined for decades. The SNP looks set to win at least six times as many seats as it took in 2010. At the other end of the country, the anti-EU U.K. Independence Party may win seats for the first time at a general election. Miliband has returned repeatedly to the future of the state-funded National Health Service as a campaign theme, arguing that the Tories are bent on its privatization. He’s accused Cameron of pursuing policies that only favor the rich. Clegg has set out six “red lines” that he’ll demand as the price of joining a new coalition, including higher education and health spending and pay increases for public-sector workers. Cameron has made it clear that the holding of an EU referendum represents his own red line. Clegg has not ruled out accepting that demand. I thought so. This is one of the most complicated elections ever. I have no love of David Cameron. Yet I am rooting for him because of his promised up-down vote on the UK remaining in the EU. Although there is no reason to believe Cameron will keep his word, there will not be a vote for certain if Labour wins. Such is the sorry state of politics. How about a vote for "none of the above"?